Experienced and novice writers are presented together in this unique volume of monologues and short scripts. This anthology highlights a significant force in contemporary American theatre-the growing presence of women as playwrights. Award-winners are here, and so are undiscovered voices. They have one thing in common…their individual artistic journeys all include time spent in Kentucky-some for a short while, others for a lifetime. 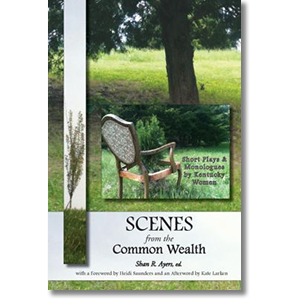 Playwrights whose work is in this book are Naomi Wallace, bell hooks, Arlene Hutton, Sallie Bingham, Liz Fentress, Nancy Gall-Clayton, Anne Shelby, Trish Ayers, Constance Alexander, Belinda Mason, Beth Dotson Brown, Linda Caldwell, Carolyn Bertram-Arnold, Brenda White, Denise R. McKinney, Gail Livesay. The collection is edited by Shan R. Ayers, theatre professor at Berea College in Kentucky. The anthology also includes a foreword by Heidi Saunders and an afterword by Kate Larken. Experienced and novice writers are presented together in this unique volume of monologues and short scripts. This anthology highlights a significant force in contemporary American theatre-the growing presence of women as playwrights. Award-winners are here, and so are undiscovered voices. They have one thing in common...their individual artistic journeys all include time spent in Kentucky-some for a short while, others for a lifetime.